It is now the festive season and The Whisky Boys have organised their Annual Dinner and Saturday the 1st of December was the day, the venue The Dinning Room at The Scotch Malt Whisky Society in Queen Street Edinburgh. The day started at noon when Jim and Nicola together with Jacqueline and Scott boarded the train from Croy where we met up with Helen Stewart (SMWS UK Brand Manager), our destination was Waverley Station in Edinburgh. We made our way to SMWS’s home at the Vaults in Leith, this is where we had decided to have lunch and a couple of ales and a dram or two, the chat was great the staff gave us the best of attention and the afternoon was flying in. We reluctantly left the Vaults and took a short walk down to the docks and popped into the Roseleaf public house which was busy and bustling and had a great selection of real ales and fine Whiskies, we only stayed an hour or so and enjoyed the buzz that was all around, Christmas was certainly in the air. We had our table booked at The Dining Room for 6 pm so from the Roseleaf we hailed a taxi to Queen Street, all looking forward to a great night of fabulous food and excellent Whiskies and wine. First Course – Amuse-bouche which comprised of finely sliced smoked duck, this was accompanied with a nice smoky Bowmore dram, this is the only course we all had Whisky. Second Course – Hand-dived scallops, orange and bay sauce, chorizo and dried black olives. This was enjoyed with the SMWS dram 5.34 a 13 year Old Lowland, and Jacqueline enjoyed a lovely Albarino, DO Rias Baixas, Martin Codax wine, with Scott having a fine IPA. Third Course – Jerusalem artichokes veloute, Brussels sprout leaves, roast chestnuts, red wine artichokes, gougeres. 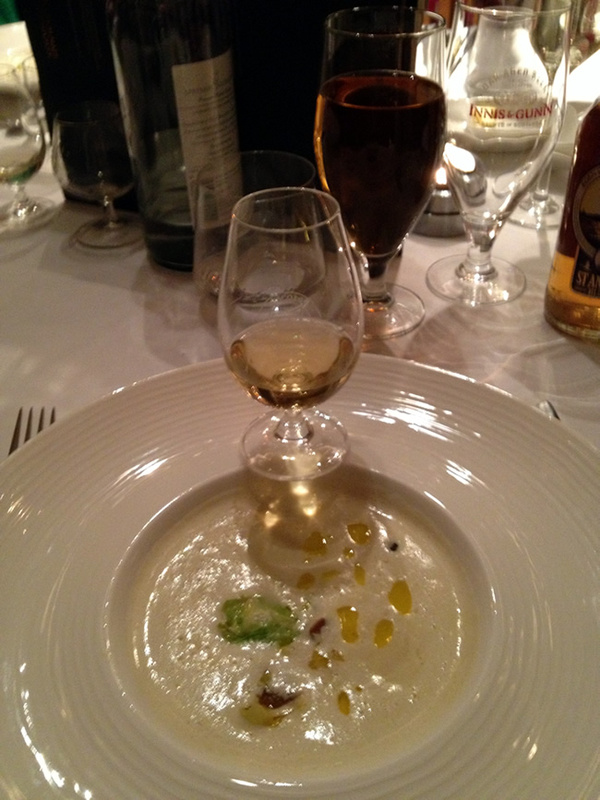 This course was paired with the SMWS 31.24 a 24 Year Old Island dram, Jacqueline tasted the fine Coates and Seely, Blanc de Biancs a very refreshing sparkling white wine, Scott decided to try the Orkney IPA. 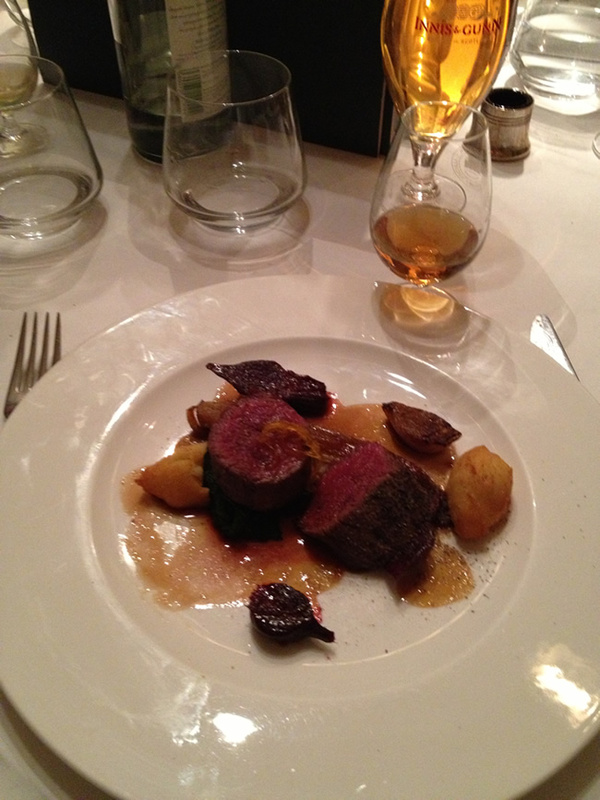 Fourth Course – Loin of venison and Lapsang Souchong and orange, caramelized chicory, baby beetroot, potato dauphine. This game delight was enjoyed with a SMWS 71.37 a 14 Year Old Speyside, this time Jacqueline loved the lovely red Gigondas, Jerome Quiot. Scott was still enjoying some of the fine bottled ales from the bar. Fifth Course – Pistachio cake, preserved cherries, lemon curd, whipped mascarpone. Our final Whisky to accompany our sweet was a SMWS 76.94 a 26 Year Old Speyside, whilst Jacqueline was not keen on the sweet Chianti and decided to change back to the delightful Blanc de Biancs sparkling white wine, Scott was in his glory enjoying his great choices of bottled ales. What a night, we didn’t finish there, we ordered coffees and a cheese platter. 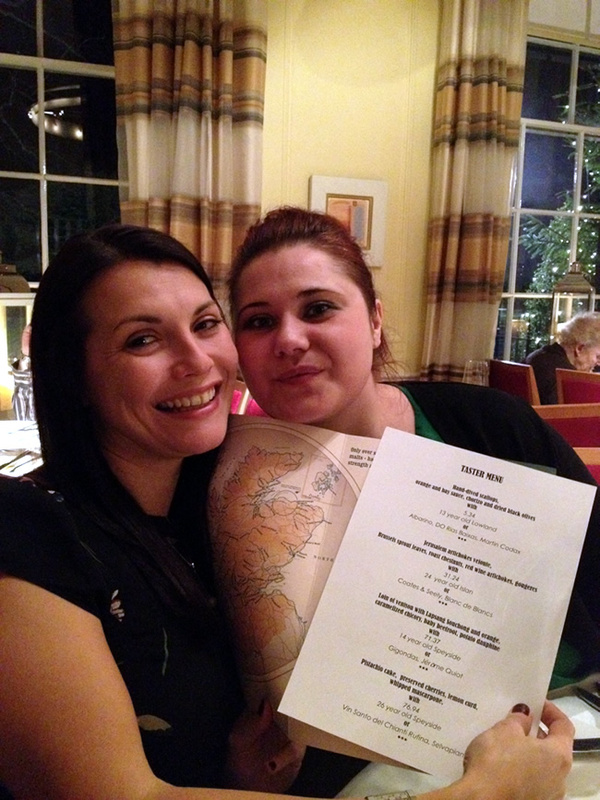 We were all in agreement that the quality of the food, the drams, wines and ales, the calibre of service and the ambiance of the Dining Room made for the finest meal any of us had experienced in a long time. This was an experience that we are planning to repeat in the near future. The Whisky Boys visit both SMWS venues on a regular basis and usually only have a bar lunch on a couple of drams or an ale, but the Diningroom Restaurant will be seeing a lot more of us. 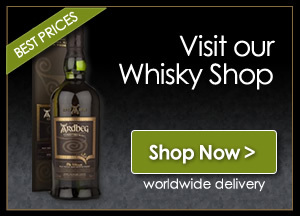 We can highly recommend that you join the Scotch Malt Whisky Society, you will enjoy the benefits of visiting all the venues including London and associate venues throughout the World, together with the biggest selection of Single Malt, Single Cask and Cask Strength Whiskies any where in the World. Now add to that one of the finest Restaurants in the UK. 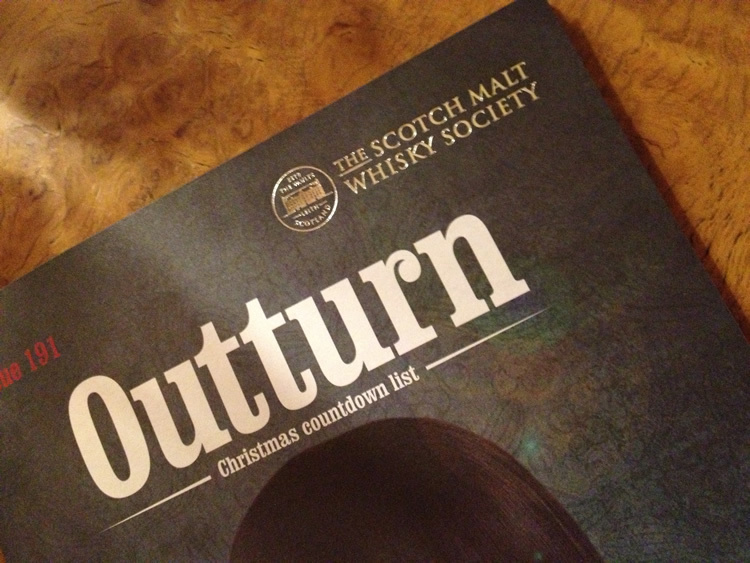 Remember it is only members that can purchase bottles of these fine drams. To finish of the night we all retired to the Hunter Suite with some great drams, wine and ales for an hour or two prior to getting a late train home. The Whisky Boys can only thank everyone, but especially the chef for a fantastic day at the Edinburgh venues of The Scotch Malt Whisky Society.